(AINA) -- The oppression of the Iraqi Christians started when Arabs occupied the land in the seventh century. Their method of wiping out Christianity from the region involved the implementation of a simple rule: either convert and follow the Islamic banner or pay heavy taxes (which many Christians could not afford) or face war. Looking at more modern history, the first genocide of the 20th century began on April 24, 1915. By 1918, 2.65 million Christians including 750,000 Assyrians, 1.5 million Armenians, and 400,000 Greeks were killed by the Ottoman Empire and the Kurds. The Assyrians called this genocide "seyfo" which means sword. In 1933, the massacre of Simmele, in Northern Iraq, resulted in the death of 3000 Christians at the hands of the Iraqi Army. This was the first atrocity committed by the new Iraqi state under after gaining independence from the British in 1932. My village Tin, in Northern Iraq, shared a similar fate in 1961. A two month infant was kidnapped, beheaded, roasted, and returned to his parents. 14 year old Ayad Tariq was considered a "dirty Christian sinner" and decapitated. Fr. Paulos Iskander (Paul Alexander) was kidnapped, beheaded and dismembered. Five priests were kidnapped and released after ransom was paid. Five other priests and three deacons were murdered. 59 churches were attacked or bombed since June 2004: 40 in Baghdad, 13 in Mosul, 5 in Kirkuk and 1 in Ramadi. At least 13 young women were abducted and raped, causing some of them to commit suicide. Female students were targeted in Basra and Mosul for not wearing veils; some had nitric acid squirted onto their faces. Elders of a village in Mosul were warned not to send females to universities. Mahdi Army circulated a letter warning all Christian women to veil themselves. Children were kidnapped and forcibly transferred to Arabs and Kurdish families. Property was confiscated by Kurds in the North and in the south by Shiites and Sunnis. Kurdish authorities forced public works projects to divert water and other vital resources from Assyrian Villages to Kurdish villages. While the Arabs protest for one Muslim killed in Europe, they are silent for what happen to the Christians of Iraq, the people of Darfur, or the Coptic in Egypt. I know we are a democratic and civilized nation and they are not. I know we are strong and forgiving while they are weak and loud. We should not have to improve our image to the Middle East, for we have freedom that millions of Arabs and Muslims enjoy and take advantage of. I have lived in Iraq for 33 years; I know how they treat their people in the streets and in the prisons. Their prisons are many times worse than what occurred in Abu Ghraib. In your message you try to build a bridge to the Islamic world, but you left the non-Muslims in the Middle East angry and alone. They deserve your support, they love freedom as much as we do, and now they face extinction. Fifty percent of the Christian population has left Iraq with the other half facing the continuation of a long, bitter genocide -- and it will be under our watch. An Islamic nation without Christians, a Middle East without diversity, will only become more radical. Paul Bato is a native Iraqi artist. He is a 1982 pharmaceutical graduate of the University of Baghdad. 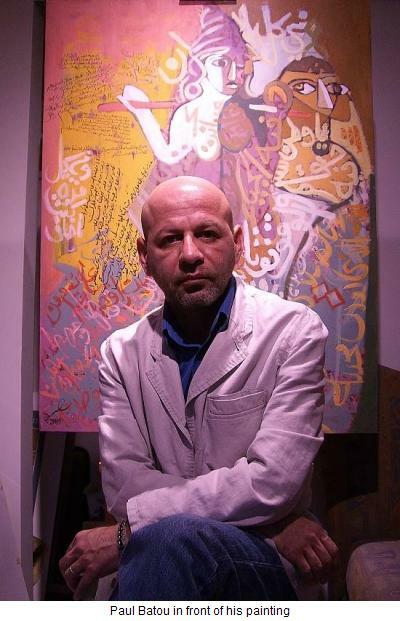 He was denied entry to the Baghdad Art School because he was not a member of the Ba'ath party. He continued his arts studies while in pharmaceutical school. His first art show was in Baghdad in 1980. In 1982 he was forced to work as a pharmacist and a medic during the Iran-Iraq war for five years in the army. When it ended in 1989 he left Iraq with his family and moved to Los Angeles, where he continues to create art. In 2007 he published his first book of poetry, titled My last thoughts about Iraq.